Danny Simmons, keeper of culture, steward of word, custodian of fine arts and village counselor, retains his sovereignty here in Brooklyn, evidenced by how rapidly tickets are moving fast for the RestorationARTS Def Poetry Jam Reunion. Curated by Simmons, the assuredly powerful event takes place at the Billie Holiday Theatre this Saturday, September 15 in afternoon and evening performances. Among Danny’s Def family members returning to celebrate are poet-legend Sonia Sanchez, whose work shaped the Black Arts Movement; and spoken word artists Liza Jessie Peterson, Steve Colman, Ursula Rucker, Bonafide Rojas, and Derick Cross, among others. Craig SirmuMsila Grant aka “muMs da Schemer” will host. 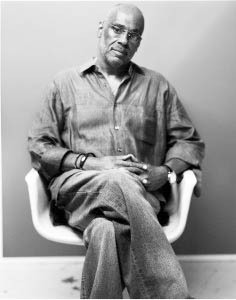 “From the beginning, we knew our poetic voices could make a huge difference on the cultural landscape of America,” says Simmons, who also once told Our Time Press that the role of the artist is to shape, develop and work the craft, then give it to the world. That thought takes centerstage this Saturday when RestorationART launches its season with this milestone “Jam.” For tickets and additional information, visit: www.billieholiday.org and www.restorationart.org, or call: 866-811-4111. In the mid 90’s, you would often find a dreadlocked Danny Simmons walking his Clinton Hill neighborhood with a giant dog by his side. Back then, most of the young folk in the neighborhood, myself included, had no idea of this unassuming man’s famous lineage. He was just the cool art guy with the giant dog. But, that art guy has made his life’s work about community development through the arts. Danny Simmons is a cultural icon, and no matter where he lays his hat, he still calls Brooklyn home. Next articleOne on One With Dr. Lester W. Young, Jr.